We are elated to welcome Ms. Amina Husain as our Fifth Grade Teacher at Al Fatih Academy! Ms. Amina earned a Master's in Education from the University of Maryland, College Park and has several years of teaching experience in Montgomery County, Fairfax County, and Albemarle County. 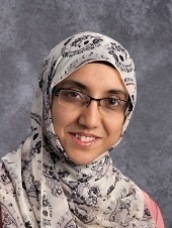 Ms. Amina has also been a great asset to our school over the past year as a volunteer and a Substitute Teacher. Ms. Amina's favorite part of teaching is helping students become confident, successful learners and positive contributors to the world around them. She enjoys good conversation, a good cup of mint tea, and a good book, all preferably on a beach! She is excited and looks forward to a wonderful year in Fifth Grade, inshaAllah.